My son was living in Canada at this time of this trip and he was driving his car thus I measured driving distances in kilometers but in this document the corresponding miles will also be given following in brackets. August memories began when in the last week of July Stu phoned me from Vancouver with the suggestion that if I could fly there we could travel back to Nebraska together. Within a week I was on a plane flying west in time to spend the August long weekend with Anna and Walt in their new home, Stu having gone to the Sunshine Coast for a few days. I met Stu’s girlfriend, Holly, on the Monday evening when Anna, Walt and I were invited to Holly’s for dinner. 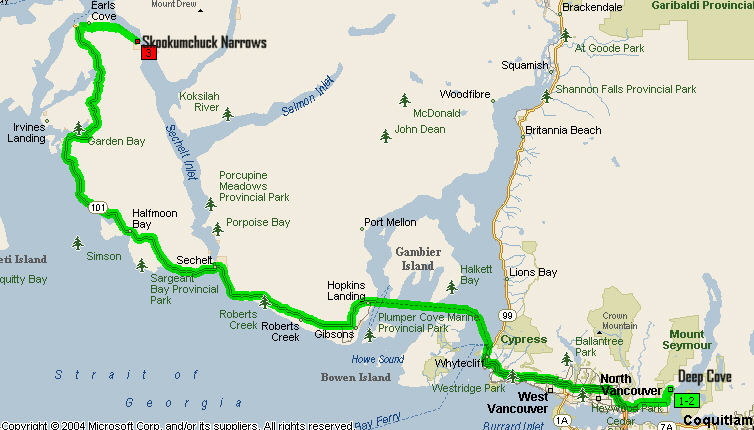 It was decided that Stu would take me on a day trip to Skookumchuck Narrows the following day. When Stu picked me up at Anna’s, Holly was with him as she had decided to take the day off. It was a great way for me to get to know her. We drove to Horseshoe Bay where we took the ferry to Langdale and from there drove to Gibsons. Here, looking out over the water, we enjoyed a wonderful breakfast at Gramma’s Pub near Mollys Reach. We also stopped at an art gallery before reaching Egmont. Stu parked the car near the trail head for Skookumchuck Narrows and we set out through the forest. It was a long walk, up hill and down, but we finally made it. I did not note how long it took to get there, but the return hike was an hour and ten minutes! Although we were not seeing the tidal flow at its peak, it was still fascinating to watch the eddying water as it flowed through the narrows into Sechelt Inlet. Here we set out our lunch and sat on the rocks to eat it. Although we did not linger anywhere on the return drive to Langdale we were unable to board the ferry due to earlier delays in the schedule. It was decided that I would go ahead as a foot passenger, have Walt meet me in Horseshoe Bay and Stu and Holly would come on later. They finally arrived at Anna’s and Walt’s around 10 o’clock! Anna and Walt said “Goodbye” before they each left for work. Because of the previous late night it was noon by the time Stu came, packed my things in the car and we got away from Anna’s. The idea was to get to the other side of Seattle before doing any serious sightseeing. We had to stop for lunch, so almost two hours had elapsed since leaving and our getting through Customs and into Washington. Stopping for gas on the northern outskirts of Seattle, we drove south on WA-99 through downtown rather than returning to the Interstate. Wonderful views of Mount Rainier dominated the city skyline. The traffic moved smoothly until south of the city where we had to rejoin the Interstate! It then took us an hour and twenty minutes to cover the next 50 miles! We even tried the car pool lane, reserved for buses or vehicles with 2 or more passengers, but the traffic was still stop and go! Slow! Slow! Slow! But at 5 o’clock, what else could we expect? Five lanes of traffic, but we did have great views of Mt. Rainier rising up out of the clouds. An hour later we took a half-hour break to walk around the State House in Olympia, and shortly after returning to I-5 we turned west on US-101. By this time the sky had clouded over and the air was much cooler. At 7:30 we stopped for the night at the Flamingo Motel in Aberdeen. We walked across the road to the local supermarket, where we bought some supplies for our trip as well as a hot BBQ chicken for our supper. The day began dull and cloudy and before heading out of town we stopped for coffee at Starbucks. Leaving Aberdeen we crossed the bridge over Grays Harbor and seeing the mud flats below indicated that the tide was out. Broom shrubs were blooming as well as many other flowers, and it was not long before we began seeing oyster shells at various points along the shore. Also, after leaving Aberdeen, we started to notice evacuation route signs, new since I was in the area five years ago. Stu pointed out to me the word in smaller print, Tsunami. The evacuation routes were pointing to higher grounds should there be a tsunami wave which can flood the surrounding lowlands. Before reaching the Pacific we turned north into Westport, an attractive fishing village on the south headland of Grays Harbour. Here we climbed to the top of the observation deck for a good coastal view. A number of pelicans were flying overhead. Also we drove around looking for the Grays Harbour Lighthouse, a sculpture of which I have in my collection. Heading south from Westport on WA-105 towards Raymond on the Willapa, we passed cranberry bogs and continued to see heaps of oyster shells. There was a variety of flat iron sculptures (animals, birds, fishermen, hay rolls) all along the street and at each end of Raymond, where we joined US-101. Gray clouds still hung overhead but the sun was shining on the opposite bank of the South Fork Willapa River. There were piles of oyster shells everywhere you looked as we entered South Bend - “Oyster Capital of the World.” When claiming notoriety I wish that towns would consider themselves as “Oyster Capital of the USA” rather than of the world, which would be a more credible claim. Here in South Bend we went in search of and found the 1911 court house, a building which was written up in the AAA Tour Book as being an excellent example of Second Renaissance Revival architecture. Driving on through forested areas there were signs informing passers-by about when the trees had been harvested and when replanted. It is sad that there is little left of the old forests, but it is good that the need to replant has been recognized. At Seaview we continued south to Fort Canby State Park and as we turned towards North Head Lighthouse we drove through a beautiful thick forest. At the end of the road we had to walk to the lighthouse, where we climbed the stairs to the top. Leaving here we drove past but did not stop at the Lewis and Clark Center. 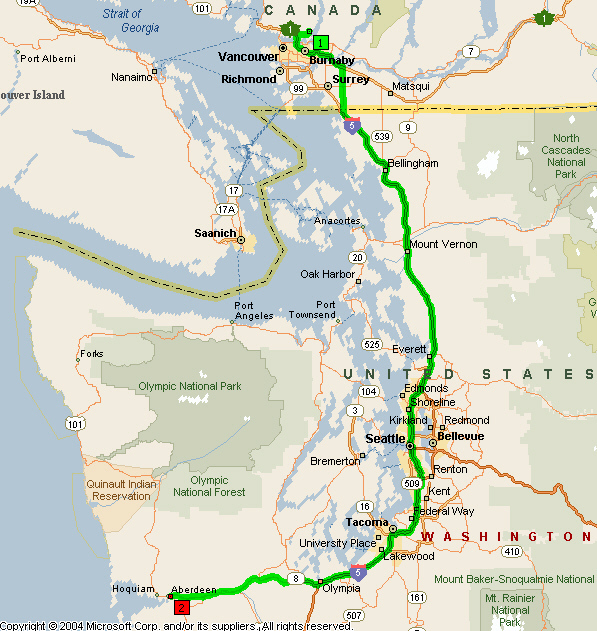 Instead, we returned to Ilwaco, rejoined US-101, the Pacific Coast Scenic Byway, and followed the Columbia River east to the bridge to Astoria, Oregon. We stopped briefly in Astoria to shop at Josephson’s, a renowned smoked seafood house. Back on the Scenic Byway we crossed another bridge, this one over a large bay off the Columbia River and drove into Waltton. We had a picnic lunch in Eban Carruthers Park, and after eating, walked down to the water where we talked, or I should say listened to an old guy, Herbie, a cyclist who told a lot of interesting tales. Our next stop was in Seaside, Oregon’s largest and oldest ocean resort. There were so many people around we were lucky indeed to find a parking spot while we looked at the Lewis and Clark Monument on the Promenade at the foot of Broadway. Whilst here we also went in search of the replica of a salt cairn built by the Lewis and Clark party in 1806 to extract salt from sea water. FOR THE RETURN TRIP TO CIVILIZATION. POINTED OUT THIS PLACE TO HER WHEN SHE WAS A YOUNG GIRL. SHE WAS BORN IN THIS VICINITY ABOUT 1816 AND DIED IN 1905. Back at US-101 we were soon stopped for road work near the junction with US-26. Over the next few days we would be experiencing delays for road work, which is all part and parcel of summer travel! We turned into Cannon Beach and Tolovana Wayside briefly, stopped at a Viewpoint on US-101 and walked down onto the beach at Hug Point where Stu waded in the water. How we wished we could have spent more time here! The next point of interest was the Cheese Factory in Tillamook, where we toured the premises, bought cheese and enjoyed a delicious ice-cream. Although late when we left the cheese factory, we headed back towards the coast instead of continuing on US-101. Just after crossing the Tillamook River, we turned onto Three Capes Scenic Route. We made a small detour to Cape Meares village at the end of the road, then returned to the Scenic Route. Trees overhung the road as we went uphill through the forest, and about two miles further on we turned into Cape Meares State Park to visit the lighthouse there. It was too late to be able to go in the lighthouse, but we could walk around it. Also, walking down the path through the trees towards the lighthouse there was a wonderful opportunity for a photograph of the Fresnel lens with the sun shining through it. From the Cape Meares Lighthouse we went on to Netarts, where we stopped at the General Store to replenish our supplies. It was already 7 o’clock and we were anxious to find somewhere to camp. Leaving the store, we immediately turned off for Cape Lookout State Park where we had hoped to stay that night, but as we turned into the park, there was a sign - Campground FULL! We returned to Three Capes Scenic Route, a fabulous road through the woods, the road completely covered with overhanging trees creating a tunnel effect. We continued south, drove by an expansive area of sand hills and shortly after 7:30 arrived at Whalen Island, where we managed to get a camp site. It was the end of a long day! We got away from Whalen Island about 8:40 and had gone several miles when Stu remembered that he had forgotten to take down his rope line, which had been tied between the trees. We stopped for gas in Pacific City where I would have liked to spend some time on the beach but after the previous long day it was felt that we should make faster progress before dilly dallying! 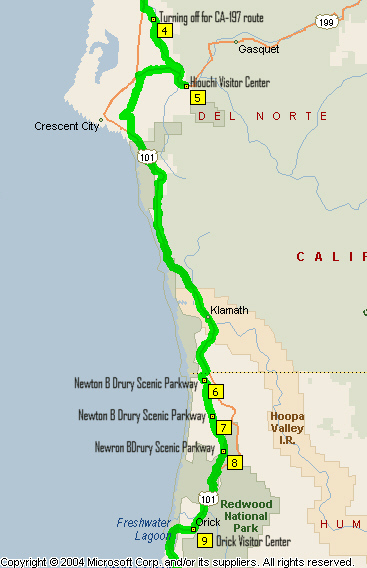 We came to the end of Three Capes Scenic Route at the junction with the Pacific Coast Scenic Byway, US-101. As we entered Lincoln City, we crossed the 45th parallel, a point half way between the Equator and the North Pole. We spent some time at the factory outlets but were not tempted to make any purchases. Then it was on to Depoe Bay, which claims to have the world’s smallest harbor, where we watched fish being filleted. It looked as if people had returned from a fishing trip and could have their catch filleted for them. There was also a seal swimming around within the harbor. Our next stop was to visit the Yaquina Head lighthouse, but, because of the number of people there, I decided that I did not want to be rushed when climbing to the top. So I forwent doing that, but spent some time at the Interpretive Center. Soon after leaving Yaquina Head we passed the western terminus of US-20, a route which cuts across northern Nebraska and the eastern end of which can be found in Boston, Massachusetts. We stopped in Yaquina Bay Park for a picnic lunch and walked around the lighthouse there. As soon as we returned to US-101 we immediately drove across the historic Yaquina Bay Bridge. After this it was decided that we should try to get some distance behind us, and, during this period, we passed the turnoff for the Umpqua Lighthouse, the farthest point down the Oregon Coast that I had been previously. At North Bend we left US-101 and crossed an estuary into Charleston where there was a large fishing fleet. Then we turned south along the road for South Slough Estuary Sanctuary. The countryside was quite different from anything we had seen earlier in the day, and unexcepted, with deep gullies and wooded mountains. Some areas looked as if they had been replanted recently, others clear cut, some with huge stumps and others with very small trees. There were also open farming areas where hay had been cut, after which we would drive back into large trees again! The road actually followed a ridge and the mountains to our left look as if they went on for ever. Back on US-101 we crossed the bridge over the Coquille River and drove through Bandon where I noticed a police car near the road’s edge in a good position for checking speed violations. I also happened to notice that the figure in the police car was really just a model! Realizing that this was a Friday and wanting to be sure of getting a campsite we left the highway for Bandon State Park, looking unsuccessfully for somewhere to camp. Back on the highway we saw a lot of cranberry bogs and more again near the turnoff for Cape Blanco. There were some beautiful views of sea stacks at the south end of Point Oxford. Then followed a pretty rugged piece of coastline with the road hugging the cliff before turning into the mountains. Less than a mile into the valley we turned into Humbug Mountain State Park Campground, where, after crossing Brush Creek the road turns back along the valley toward the beach. Although there were many campers, we were able to look at a number of sites and finally settled on # B39 which was under the trees and not too far from the showers and toilets. It cost us $16.00 + $4.00 for wood. Having secured a camp site we returned to Point Oxford to do some shopping. Whilst Stu was in the store I used my cell phone to call LP and found out that he was having surgery the following Tuesday morning for a hernia! Back at camp we walked through to the beach to see the sun set. Leaving our camp site at Humbug State Park at 8 o’clock, we again crossed Brush Creek which flows through the valley and campground. We joined US-101, which follows the course of the creek in a narrow valley north of Humbug Mountain, around behind of the mountain and back at the coast. When stopped to take a picture looking north to Humbug Mountain two deer ran across the road. There were lots of signs for myrtlewood carvings as we approached Gold Beach and south of there the delicate flowers of the wild sweet peas contrasted with the huge rocks at the ocean side of the road. We left US-101 to take the road to Carpenterville, a paved back road which was the original route of the highway, rejoining 101 just north of Brookings. In the Oregon Coast Mile-by-Mile Guide, the road is described as a driving adventure and not advisable for RVs or the faint of heart! Twisting and turning into the mountains the speed limit was posted as 30 mph for 12 miles! As well as being forested, some of the mountains had been clear cut and were grassy. After reaching the summit we followed a ridge, which allowed occasional glimpses of the coast. Descending, the road hugged fern-clad slopes and went in and out of trees which formed a canopy over it. Back on US-101, we immediately left it for Samuel A. Boardman Monument and the Coast Trail. Here we hiked some distance down the steep trail, but gave up before getting to the coast. Nor were we able to see the ocean through the growth surrounding the trail. As we returned to the highway fog rolled in off the ocean blanketing everything. We stopped at the Oregon Welcome Center and a few miles further south made a small detour to view the largest Monterey Cypress in Oregon. Here we also saw our first gum tree and I think that we were more interested in this than we were in the Cypress! A few minutes later we reached the California State Line Inspection Station, where the inspector, a rather officious and obnoxious fellow asked if we had a cooler on board and wanted to see its contents.! In the end we left without any difficulty. We were hardly into the state before I noticed their state flower, Eschscholtzia, the California poppy, blooming. I also noticed a lot of very short stemmed lilies in flower. This was explained when we entered Smith River, with its sign claiming to be “Easter Lily Capital of the World.” There were acres and acres of lilies. Once again we turned off the main highway, this time to take CA-197, North Bank Road. This road followed the rocky bed of the Smith River, which had a small amount of water flowing in it. Fireweed, daisies and Queen Anne’s Lace were all flowering profusely. Whilst at the Hiouchi Visitor Center for the Redwood National and State Parks, Stu discovered there was an unpaved road we could take though the Redwoods. So from here we crossed the bridge on South Fork Road over South Fork Smith River and turned onto Hill Road, which doubled back along the opposite bank of the river. Stout Grove was the reason for taking this road through the forest, a drive which was well worthwhile. At Stout Grove we went for a walk along the trail feeling rather small and insignificant among such giants trees. Leaving Stout Grove, we continued our drive, the road winding around past the massive trunks of the trees, quite narrow in places, with no room to pass, and blind corners! It was a magnificent drive. Even when we were back on a paved road, it was still narrow and winding. More fog rolled in off the ocean as we rejoined US-101, now designated “The Redwood Highway,” an apt name for a road passing through stands of redwoods, no shoulder on either side. We were again stopped for road work, and watched the fog roll in as it crept through the trees. ESTIMATED AGE OF THIS LARGE REDWOOD TREE IS 950 YRS. THE LOGGERS AXE IN 1908, FOREST FIRE AND THE FLOOD OF 1964. AND IT NOW STANDS AT 248 FEET. THE DIAMETER AT THE BASE IS 14½ FEET AND 3 FEET AT THE TOP. Following lunch at Lagoon Creek, we continued driving in sunshine except when the trees were overhanging the road, but we could still see fog rolling in. Shortly after crossing a long bridge with statues of four large golden bears, one on each side of the road and two at each end of the bridge, we turned off on Newton B. Drury Scenic Parkway, where there were lots of big trees. We paused for a few minutes by one named “Big Tree.” It was 304 feet high, 68 feet in circumference and estimated to be 1,500 years old. There were many redwood groves all along the way, each with their own name. We visited the Orick Visitor Center for the Redwood National and State Parks. After getting gas in Trinidad, we returned to US-101, which was now a freeway with eucalyptus (gum trees) on both sides of the road. We were actually starting to see many gum trees here in California and both of us were soaking up the wonderful smell. We visited another California Welcome Center, this one in Arcata, a name with which Stu was already familiar. The bicycle rack he had on his car was from Arcata! A long avenue of gum trees along Humboldt Bay welcomed us as we approached Eureka, where we also saw our first palm tree. Driving around in the city we saw some pretty neat buildings, but because of the time we did not stop. I made a mental note that I would like to spend more time here! On the outskirts of the city the freeway started again, crossed the Eel River several times whilst following the valley of the river, then disappeared into the redwoods. Within half an hour of leaving Eureka, we exited the highway for Pepperwood and Avenue of Giants. Immediately we entered the forest and started to look for the various trees of interest, such as the “Immortal Tree” and “Eternal Tree House.” We had a brief view of river bed before plunging back into the forest and out again to cross South Fork Eel River. When looking at a tree clad mountain slope it looks like any ordinary forested slope but then you drive into it and “Wow!” you are among giants. At a Visitor Center we were told that the campground was full but that there were still some vacant sites ahead at Richardson Grove some thirty miles further south. We returned to US-101. Crossing South Fork Eel River and following valley of the river, the bare hills, covered in brown grass, looked pretty arid. Near the Garberville exit there were a lot of arbutus trees. Entering Richardson Grove, numerous campsites were still vacant, both in the redwood forest and in an open area, and at the entrance, we were given a map of the two campground areas so we could check out and choose an available site. Back at the entrance we registered and paid ($14.00) for our chosen camp site (#159) out in the open at the Oak Flat Campground rather than under the redwoods! We picked up our $5.00 bundle of wood on our return to the park after going back to Garberville to do some shopping. Whilst in Garberville I noticed a sign: “San Francisco 305.8 (190)”, and wondered how long we would take to get there! Campsite secured and shopping done we could then relax, and driving back to Oak Flat, Stu made the observation that the bridge over the river was a Bailey Bridge. By the time we returned to our camp site, a very strong wind had come up and there we were trying to erect the tent without having everything blow away on us! Also it was getting dark by the time we were ready to prepare our supper, but we managed, and had an excellent meal of tacos. It was 9 o’clock before we left Richardson Grove. Breaking camp and driving across the Bailey bridge Stu went on ahead after he let me out to take pictures of the redwood grove between Oak Flat and the park entrance. US-101 is an interesting “freeway” in that between each redwood grove it is a freeway, becoming a two-lane highway when winding through the forest. We left it again for CA-1 at Leggett, to visit the “Drive Thru Tree.” Here we had to pay $3.00 to enter the park, but nothing extra for driving through the tree. Stu removed his bike from its rack so he could drive through whilst I took pictures of him doing so. A sign in the park indicated that we were 1190.9 (740) from Mexico and 1400.1 (870) from Canada. For the remainder of the day and not until we were almost at the Golden Gate Bridge we would not be seeing US-101, but rather would follow CA-1, the coastal route. It started out of Leggett as a very winding road, also climbing, with the shiny salmon trunks of the arbutus quite noticeable among the many other kinds of trees, and through odd gaps distant views towards the coast. What a wonderful drive it was, a fantastic road continuously winding through the forest, with comments like ”That was fun” or “This road rocks!” Not only are the hillsides very steep but so was the road. Some of the corners were marked 10 mph. A sign announced “San Francisco 320.3 (199).” At 7 o’clock last night, and 73 (45.4) ago, we were 305.8 (190) from San Francisco! When we reached the coast the road was designated Shoreline Highway and, for the most part we would be following the California coast which both of us decided was every bit as good as the Oregon Coast, if not better! Coming into Westport, the first town after reaching the coast, the strong smell of gum trees was wonderful. Stu was enjoying it as much as I. All down the coast we continued to be very excited whenever we came to a whole bunch of gum trees, whether a forest of them or an avenue overhanging the road. You can tell we liked the gum trees! In addition to the gum trees, the road was up and down, on and away from the coast, climbing bare hills, similar to those of the Myponga area in South Australia, making the drive a rather nostalgic one. Fort Bragg appeared to be an interesting little town where it could be fun to stay for one or two nights. There were certainly lots of motels. Yes, it would be worth coming back here! A fuchsia hedge was in flower; wild sweet peas bloomed on both sides of the road; trees included gum, cypress and pine; there was a lovely cove just before Jug Handle State Reserve. We turned into Mendocino, another interesting and neat town with inns and cafes. There were many wooden water tanks built on wooden towers and some were built into the roofs of the houses, making it a really fascinating town, and another one I would like to visit again! It also had a lovely beach and would be a great place for a holiday. "a picturesque community....with many 19th-century buildings and houses. The architecture reflects the New England roots of early settlers." The coastline continued to be so beautiful we again reiterated our comparisons with the Oregon Coast, of which one hears so much. The Oregon Coast is really magnificent, but this was just so amazing. The scene was constantly changing, a lighthouse on a headland, gum trees that smelled like “home”, a glimpse of wonderful ocean views, high bridge with the town of Albion below, cliffs a shear drop below the road, and ahead the fog starting to come in - a wild coastline! The road zig zags down and back behind the hill then rises again as it goes back towards the ocean. Wild! San Francisco was now 214.0 (133) - two hours ago it was 320.3 (199)! We paused for a rest stop and to get coffee at a roadside store in Point Arena, which looked to be a farming community. The store turned out to be a deluxe gift store with lighthouse collectibles, including many Harbour Lights sculptures, also books, puzzles, you name it - anything to do with lighthouses. The coffee shop was towards the back of the store and again the emphasis was on lighthouses. In fact the proceeds from the one-pound bags of coffee for sale went towards supporting the Point Arena Lighthouse. Leaving this store we turned off the highway to visit this lighthouse, where we were able to climb the 143 stairs to the top, the equivalent of a six storey building. Ten minutes after returning to the highway, the road which was right on the coast, became a single lane. The rest of it had fallen down the cliff! We drove through more redwoods, then at Anchor Bay the gum trees were beautiful, their straight trunks displaying colorful patterns. After leaving Gualala, an artists’ colony with a lovely beach, the road was not as spectacular. On entering Sonoma County, we were getting into areas which were being developed, and there was not that same feeling of wilderness. We were also looking for somewhere to have lunch, but did not want to pay the fee being asked at all the parks along the way. Following behind three large motor homes, all pulling 4W vehicles and not going anywhere very fast, we eventually just pulled over to the side of the road. We had a roadside lunch, eating at the back of the car and enjoying the wonderful aroma of the eucalyptus trees. Continuing on after lunch, the road was still quite scenic with bare rocky promontories and suggested speed limits of 15 mph on corners! As we turned the corner on a section of “inland” road we could see how the road was built up on the opposite hill, an incredible road with lots of bends between the hills and a great reminder of Victoria’s Great Ocean Road. At one point we turned around to drive up a side road with sign18% hill in the next 3.2 (2)! Coming down looked steeper than going up, but still not 18%!! The scene was a constantly changing drama with flat, grassy headlands, the road following the hills around, bare hills overlooking the ocean, back into deep woods, then a climb to the ocean front. We had a brief rest stop at Jenner where there was a long sand spit and wind surfers on the tidal river. The houses we passed on our the right were against the road and as we came around a corner you could see all the concrete walls, and the houses literally clinging to the cliff. Suddenly there seemed to be more cars and more houses and the individual beaches each have their own name - Bodega Beach, Sonoma State Beach. On entering Bodega Bay, a river estuary with a fishing fleet, wind surfers were flying across the water. Bodega was a very busy resort area, but of course we were also getting much closer to San Francisco! The road then headed inland from Bodega through bare hills, brown grass, and gum trees, after which it made a detour for road construction. The avenues of gums were very nostalgic - there were even sheep grazing. The detour through an area of working farms, ended in Tomales near a large tidal bay; you couldn’t see the ocean, only where it would be. One would assume that the area is profitable for harvesting oysters as, driving along beautiful Tamales Bay there were a lot of oyster companies and oyster bars advertising BBQ oysters. Pelicans were flying over the bay in which there were many fishing vessels and sail boats. The other side of the bay is forested. 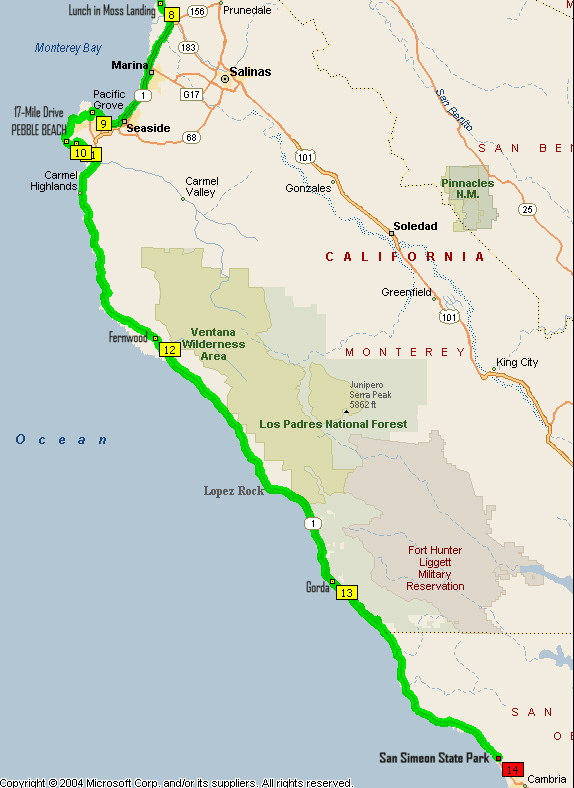 We passed the turn off for Point Reyes and the area designated Point Reyes National Seashore. After this we went into a deep, dark and wooded area, mostly gums, the road very winding, twisting and turning! Entering Dog Town, the smell of the gums was very strong and the open dairying area reminded me of the Otway Range in Victoria. Returning to a large bay, it could be considered a birder’s paradise with lots of pelicans, snowy egret and other birds. Seals were lying on sand bar. Stinson Beach on the Pacific was a congested area with a policeman directing traffic. The road continued to be congested as it climbed high on the cliffs above the ocean again and followed the curve of the hills into the valleys. From along here we also caught out first view of San Francisco. At one point we were going along a ridge with a steep drop both sides of the road. Leaving Muir Beach the road wound down into a valley with market gardens. After passing the turn off for Muir Woods, the twisting road passed some pretty expensive houses clinging to the hillsides. Then, quite suddenly, we were back into civilization! Seeing a 7/11 store, we knew that we had hit the city. We got gas in Mill Valley and could even get cash at an ATM! About a mile later we joined US-101 and immediately became part of a traffic jam. It was Sunday night and everyone was returning to San Francisco after the weekend! We could see downtown San Francisco, Alcatraz, Oakland and the Bay Bridge as we approached a tunnel. Entering the tunnel many cars were honking their horns for no apparent reason! The Golden Gate Bridge was in front of us as we left the tunnel and on the north pylon of the bridge was the sign - San Francisco, elevation 61 feet, population 723,959. There were about ten booths on the south side of the bridge where the toll of $3.00 had to be paid. From here we had to get into the right hand lane as it was the only one for 19th Avenue and CA-1, called Veterans Boulevard, which went through General Douglas MacArthur Tunnel. We had decided that because of the lateness of the hour we would not stop in the city. The traffic continued to be heavy and was slow going, so we turned west on Vicente Street and, arriving at the coast, we took the Great Highway south. It was after 7:30 when we left San Francisco and entered San Mateo County. At the junction with CA-1, the Cabrillo Highway, we immediately enter Pacifica, continued on past the Point Montara Lighthouse, past market gardens and ended what seemed a long day of driving less than 482.8 (300) at the Harbor View Inn in El Granada. We had a beautiful room and so it should have been for what we paid for it. I honestly don’t know how people can afford to stay in this kind of accommodation all the time. Fortunately, we’d had some very reasonable nights with camping. After unloading the car and bringing most everything into our room we walked across the highway to a nice seafood restaurant which the motel manager had recommended. It was almost 9 o’clock by the time we had packed everything back into the car and were on the road for the day. Safeway, Fedex, Baskin Robbins, Albertsons, Burger King, McDonalds - there was no doubt that we were back in the land of franchises!! Workers were already in fields hoeing market gardens, these between cypress groves and stands of gum trees. We turned away from the coast to follow the valley of the Pescadero Creek. We drove along the main street of the sleepy little town of Pescadero, noticing a vineyard on one side of the road and a herd of goats on the other. Bottlebrush, one more reminder of Australia, was in flower. A sign indicated that artichokes, peas and strawberries were for sale, and as the road started to climb into the hills, we passed a field of rosemary bushes. Shortly after this we came to a STOP sign for a one-lane road. This was because half the road had slipped downhill, and within a few more minutes there was another STOP sign, for the same reason! We then drove into a redwood forest only to come back out into open country. Turning onto Alpine Road, a narrow route through a dense redwood forest, was just as beautiful as I remembered it. As the road climbed we drove out of the forest, and, high up and out in the open, there were distant vistas towards the ocean. Near what was the highest point along the road we joined CA-35 for a while before turning onto CA-9 and eventually onto CA-236, Big Basin Road, the scenic route through another redwood forest. Big Basin State Park was beautiful, sunlight filtering through the trees, but, after seeing the redwoods in Northern California, I was less impressed. It was also around here that Stu finally worked out the information on the mile markers, a useful tool for knowing exact location, The number across the top, e.g. 236, is the highway number; below that is the name of the country, e.g. 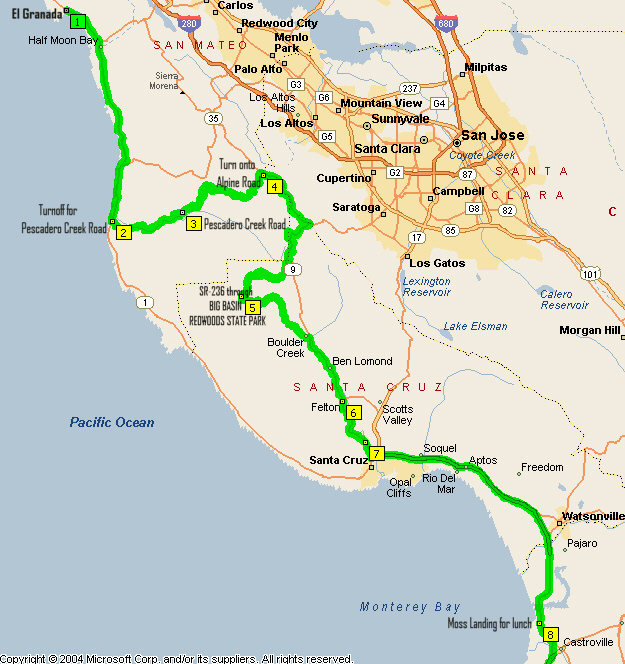 SCR for Santa Cruz; and below the county name and at a 90 degree angle is the mileage 15.0 (9.3). After leaving the park we drove through a settlement where houses were tucked in the woods and on the hillsides. Lots of flowers were in bloom: wisteria, lilies, bougainvillea and more - I had not been to California in the summer before, so it was truly wonderful to see all the gardens in flower. We rejoined CA-9 at Boulder Creek. The road was very winding and many of the driveways have mirrors for people to be able to get out onto the highway! Just beyond Felton we were stopped again where another piece of road had fallen away. The road remained in the redwoods to within half a mile of entering Santa Cruz and here we joined CA-1, the route we had left at Pescadero, but which was now a freeway. Beyond Aptos we encountered haze or fog as we proceeded through a valley of market gardens with cabbage, lettuce, and strawberries (you could actually see the ripe ones as we drove past) and lots of people doing back-breaking work picking them. The fog became quite thick as we neared Moss Landing. Unfortunately the bar was closed and would not be opening until 2:00 pm, so I was unable to show Stu the $10,000.00 worth of $1.00 bills pinned to the ceiling and walls. However, we enjoyed a great lunch next door at The Whole Enchilada - deep-fried artichokes, swordfish enchilada with olives, jalapenos and capers, also a margarita. Near Marina, the road passed through a sand dune area where we saw some para-gliders. In Monterey we drove into Fisherman’s Wharf briefly, then along Cannery Row where beautiful bougainvillea was in flower. Stu decided not to stop at the aquarium, so we drove around the coast into Pacific Grove, and there we saw a seal lying on one of the rocks and others in the water. Between the Pt. Pinos Lighthouse and the ocean we saw a number of deer - mother and baby looking out to sea, and a little further along, lying on a sand hill, another deer with antlers. We had to pay $7.75 at the security gate for the Pebble Beach Seventeen Mile Drive. The pamphlet we were given numbered the various points of interest. We saw deer following a golfer on the golf course at Inn at Spanish Bay (#4), and more deer on another golf course, apparently oblivious of the players (#9). The Lone Cypress (#16), a famous cypress tree growing on a headland, is a symbol for the Pebble Beach community. We did not complete the entire 17-mile drive, but exited at the Carmel Gate and drove down to the beach at Carmel By The Sea. Turning around, we made our way up the hill along the main street with its many galleries and gift shops. Although the street extends for a mile and there are lots of people around, the town has no traffic lights! We rejoined CA-1 to continue south. Away from Carmel the road goes along the coast and the mountains are high and bare. At one high point Stu said that it looked like Peru and Chili. It is wonderful that between us we have so many points of reference! After passing the headland where Big Sur Lighthouse is located (only open by guided tour because access is through private land), we drove into redwoods again and onto Fernwood. This was the furthest south LP and I had driven in the winter of 1999, so from here the remainder of the coast road would be new for me. At one point when we stopped for a picture high on a hillside above the ocean we could hear a strange noise below and realized that it was the barking of seals. At another place we noticed a narrow track winding up the hill and about fifteen mail boxes at the side of CA-1, but could not see any houses from the road! From a vista just beyond Big Creek Bridge, built in 1938, we could look back at the historic bridge with its four arches. Lucia is perched high up on the cliffs and the view looking south is over grassy headlands which are west of the road. Again we saw paragliders near Los Padros Beach, and after Gorda, the road climbed very high above the water but soon thereafter started a long winding descent ... ...only to go up again! Another red light warned us of a detour for a rock slide where part of the road fallen had off! Just after entering San Luis Obispo County, we actually almost went down to sea level and traveled along the longest stretch of straight road in a long while. We observed pelicans and seals lying all over the beach, and I wanted to stop at the Wildlife Viewing Area. However, we needed to find a campground and proceeded to San Simeon. Sand, surf and seals - cows were grazing at the edge of the sand dunes, there were people surfing with gliders and seals were lazing on the beach! This was the great outdoors and high up on the hill overlooking the ocean was the Hearst Castle. Arriving at the San Simeon State Park we were able to secure a primitive camp site, #127, ($17.00) in the San Simeon Creek Campground - we did not get wood. This done, we then returned to see the surfers and the seals on the beach, but the surfers were packing up. The seals, Elephant Seals lying on the beach, could be viewed from a boardwalk. There were also many interpretive signs in the area. On the way back to camp we turned into San Simeon and drove into the San Simeon Hearst Park, where red flowering gums were a blaze of color. We stopped to buy beer and ginger ale before returning to camp. Neither of us were very hungry as we’d had a big meal for lunch at Moss Landing, so we took the path from near our campsite by the creek under the bridge to the beach. We walked along the beach, watched the sunset and paddled in the breakers of the incoming tide. I woke at day break and decided to go for a walk along the beach. It was quite lovely in the early morning, with a lot of bird life about including a great blue heron as well as a great egret. We left camp shortly after 8 o’clock and a few miles down the road turned into Cambria, a really neat town with some very nice looking motels. We were pleased to find The Coffee Den Roasting Company where, sitting at a table on the sidewalk, we had coffee and muffins. About 12.9 (8.0) south of town we turned onto CA-46 and leaving the coast behind us we headed east. We had traveled down the Pacific Coast for five days and now we would be feasting our eyes on other sights! Driving through the hills between the coast and Paso Robles we felt we could easily be in Australia! The road rises rather quickly after leaving the coast. As we got into the Paso Robles Wine Grape Region we saw many wineries and acres of vines, many with netting over them to keep birds away from the grapes. CA-46 joined US-101 north to Paso Robles for a short distance before branching east to Fresno and Bakersfield. Whilst on the freeway, an oleander hedge was in full bloom in the median. Shortly after CA-46 left the freeway I noticed the following sign: Lights on for next 93.3 (58.0). I didn’t know whether the area experienced a lot of fog, smog, heat haze or dust - probably the latter! Vineyards continued for some distance, but mainly we were traveling through a farming valley surrounded by bare hills covered in brown grass. There seemed to be a lot of cattle and fields where hay had been cut and rolled. 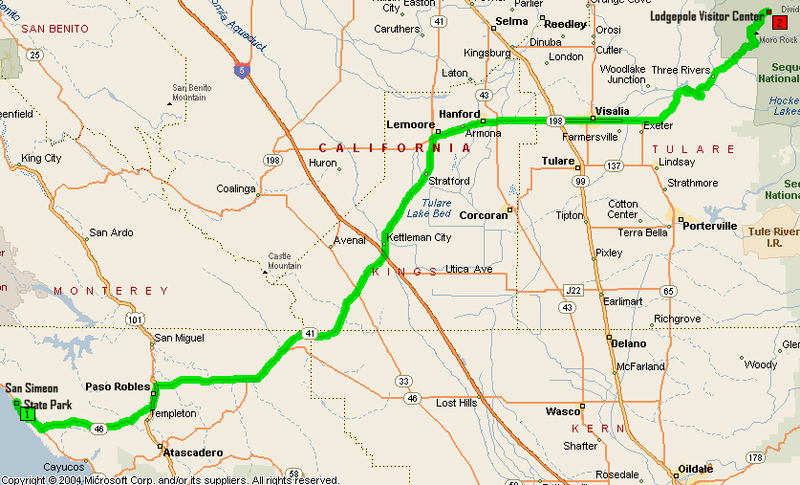 CA-41 joined our route but when the two separated, we stayed on CA-41 to Fresno whereas CA-46 went to Bakersfield. Lots of sunflowers were blooming along the roadside. Entering the Central Valley Area, Kings County, a sign warned of “High Winds and Dust.” For the most populous state this area is pretty sparse, but so are lots of other areas. The high density population is congregated in the big cities like San Francisco, Los Angeles and their surrounding districts. Near the junction with CA-33 in the middle of the valley was another sign - Subject to high winds and dust next 12.9 (8). We were now in the Cental Valley, which runs north/south, very flat with hills on both sides with only a few herds of cattle around. Going over the top of a small rise we looked across a vast valley with a few low shrubs, short brown grass and little else. After the junction with I-5, we stopped in Kettleman City and got gas. Originally we pulled into the Shell Station but there was a sign on every pump - “Sorry. Out of Gas” Neither of us recalled having ever seen this before! We crossed the California Aqueduct, which was full of water for irrigating the central plains. Without the water the land would be pretty arid. The predominant crop, miles and miles of it, was one I did not recognize and, having seen a truck loaded with what looked like sugar beets I wondered if that was what we were passing! Around Stratford there was a huge feed lot as well as sugar beets (?) and milo (or sorghum), and in the area of Lemoore there were palm trees, gum trees and orange groves. At the junction with CA-198 East, the road for Sequoia National Park, we left CA-41. The next town, Hanford, founded in 1882 in the San Joaquin Valley, was more populous, where there were stockyards, orange groves, some very tall corn and a lot of produce boxes. Next were the huge milking sheds of Land o’ Lakes Dairy, and after this peach or nectarine orchards. I thought that the half dozen or more really huge sheds, or at least roofs with open sides, were possibly for shelter from the sun for the cattle! Immediately after the junction with CA-99, north to Sacramento/south to Los Angeles, we entered Visalia, and from here we could see the outline of the mountains through the haze. We restocked our supplies at Albertson’s and got ice for the cooler. It was extremely hot, fortunately bearable because it was a dry heat. Lovely homes, surrounded with lawns, palms and oleanders would require lots of water. It reminded me of Kalgoorlie, Western Australia, except for the mountains on the horizon! Back on CA-198 we continued to see fruit trees and in some cases there were signs on the fence as to what was in the orchards - almonds, plums, olives and apricots. We started to see rocky outcropping of the Sierra granite whilst some orchards extend into the foothills as far as Lemon Cove. Climbing into the mountains we observed that the water in Kaweah Reservoir was at a very low level. In Three Rivers we saw a hedge of flowering crepe myrtles. 8.0 (5) later we entered Sequoia National Park - entry fee $10.00. The road through Sequoia National Park is called Generals Highway. We stopped at the Visitor Center, but not for long, having been told of construction ahead and that the up traffic would be leaving around 1 o’clock! We soon reached the line of cars in the construction area and were being escorted by a pilot vehicle as the road zigzagged uphill, the giant rock, Moro Rock, high above us. A rock wall, with beautiful stonework, was being built at the side of the road. We passed the 3,000 foot elevation marker and kept on climbing, climbing! We reached the end of the construction and passed the 4,000 foot elevation marker. What an incredible drive! The impressive views were like looking down into an amphitheater with the road winding up, surrounded by granite capped peaks. PClimbing, climbing! 5,000 foot elevation marker - 2,000 feet in 9.7 (6)! Still climbing, we were entering a giant forest of large cedars, oaks and massive pines. We turned off for Moro Rock, but stopped on the way to view Auto Log, a mammoth fallen sequoia log, on which, in days gone by, people took pictures of their cars on top of the log! Reaching Moro Rock we discovered that a steep stairway led to the 6,275 foot summit, more than 6,000 feet above the San Joaquin Valley, over which we had just driven. Although I have since regretted not making the effort, I decided against trying to keep up with Stu, who climbed to the top! I only went part of the way, and in so doing had some wonderful views of the surrounding country. Before leaving the area, we sat on a log to have our lunch. Then it was on to General Sherman, the biggest of the big! I found the sequoia trees simply overwhelming, and frustrating, as it was well nigh impossible to take pictures of them. They are just so immense. We stopped at Lodgepole Visitor Center, elevation 6,270 feet, and ten minutes after leaving there, we were at an elevation of 7,335 feet. Whole hillsides were of granite and the road cut through it. Entering Kings Canyon National Park, we turned off for Grant Grove, first stopping at the Visitor Center, elevation 6,589 feet. Then walking through the sequoia grove we saw the second and third biggest of the giants, the General Lee Tree and the General Grant Tree, both growing along the same trail. After this we had a 48.3 (30) drive to Cedar Grove, where we had been assured we would have no problem getting a campsite. We passed an alpine meadow near Princess Campground at the 6,000 foot elevation, then dropped to 4,000 feet as we descended into Kings Canyon. Much water tumbled over the rocks, as we followed the course of South Fork Kings River into Cedar Grove. At the Cedar Grove Village Market we bought wood and beer, then drove on to Moraine Campground where we had decided to find a suitable campsite (only $7.00 with my Golden Age Pass). It was dusk when we were setting up the tent. Then, as instructed, we moved from the car ALL food items and everything that had any odor or perfume such as toiletries and stashed it in a metal bear-proof safe. By this time we were cooking our supper in the dark, but what a wonderful day it had been! So much to see, from the Pacific Coast to the mountains and the largest living things on earth! Before leaving Cedar Grove we drove to Roads End where a ranger was just opening the information center and I was able to get a Passport cancellation. After this we had to retrace our route of the previous night, Grant being 16.1 (10) and Fresno 123.9 (77) from Boyden Cave, where the road began the long climb from the canyon floor. The road we were traveling, Kings Canyon Scenic Byway is also CA-180. Kings Canyon National Park is actually made up of two different areas, the Grant Grove and Cedar Grove areas and these are separated by Monarch Wilderness and Sequoia National Forest in Fresno County. Leaving the river valley for the main big climb, a fox ran across the road in front of us. Shortly after attaining the 6,000 foot elevation, we turned off for Converse Basin, but the signs were somewhat confusing and I am not sure that we actually saw this particular area. However, we did find Stump Meadow where there were numerous stumps remaining from the felled trees of a hundred years ago. We stopped in Grant Grove Village and again went to the Visitor Center before leaving for the 91.7 (57) drive into Fresno. We had intended taking back roads to Yosemite, but thought it would be quicker to go through Fresno and take one of the main roads. We descended from the Sierra Nevada with distant views for many miles over the foothills and beyond to the San Joaquin Valley, a valley covered with the green of orchards and vineyards, except for a few odd brown hills sticking up in that sea of green. "more than a million acres in the San Joaquin Valley are irrigated; on this land grow the grapes, oranges and cotton that make Fresno County one of the nation’s agricultural leaders. More turkeys are raised in this area than anywhere else in the country." In less than 46.7 (29) since leaving the junction to Sequoia National Park we have dropped over a mile in elevation and, when we get to Fresno we will have dropped another 706 feet or a total of 6,295 feet in about 90.1 (56). Back in the San Joaquin Valley we drove along a road with orchards on one side and rocky dry hills with sparse vegetation on the other. Then there were cotton fields, the pods bursting open and vines with bunches of red grapes hanging on them. Near Minkler, where there were almond, nectarine and apricot trees, we crossed Kings River which had quite a good flow of water. We were confronted with a sign: “DO NOT PASS” as we approached a truck with a lighted sign “LANE CLOSED” and, stopped in Centerville, a lot of traffic piled up behind us. We were still on CA-180, called Kings Canyon Road, and driving along at about 10 kph behind the “LANE CLOSED” truck. After twenty minutes and only covering about a mile and a half, we turned south on the road to Sanger to get away from the line-painting truck! We passed a piece of equipment which I had never seen before - a fruit tree pruner with four arms at right angles which rotated and on each arm a rotating cutting disc. It was only a short distance into Sanger where we turned west to meet up with the main highway, CA-99, into Fresno. The countryside was as flat as a pancake and with all the dust and haze you wouldn’t even know there were mountains to the east. We went through Fresno on CA-99 until exiting on CA-41 for Yosemite. By the time we reached the outskirts of Fresno we could again see the mountains dimly on the skyline. The countryside changed from orchards and vineyards to rolling grasslands and as we went into the foothills some granite outcropping occurred. Over the next few miles we rose to 2,000 feet, stopped for gas in Coarsegold, rose another thousand feet, but then the road descended into a valley, a drop of 711 feet into Oakhurst, a very nice town for a jumping off point for Yosemite. We had passed the 5,000 foot elevation marker when CA-41 ended at the Yosemite National Park boundary The park entrance fee was $20.00. We crossed a big Bailey bridge over the South Fork Merced River in Wawona, where lots of small pink flowers bloomed along the roadside. Once again we were escorted through a road work area. Above 6,000 feet near Chinquapin there was a sign, “all chains required” which was turned sideways. A lot of dead trees in the area were silent testimony of forest fires. Then we started to descend into the valley, getting our first view of El Capitan and Half Dome just before going through a tunnel. I was surprised to find that we could still drive ourselves into the valley. We had a super lunch: roll-ups with turkey, avocado, lettuce, tomatoes, cheese, carrots, in a very nice picnic area under the trees in Yosemite Valley. It was a very pleasant setting with people paddling and swimming in the Merced River and Stellar Jays flying around. After lunch we drove on up the valley to the Camp Curry turnoff then turned for the return drive. At the junction with El Portal Road (CA-140) to Merced, we took Big Oak Flat Road which becomes CA-120 to Manteca and is also the Tioga Road which is the one we would be taking. We paused briefly at a viewpoint for pictures looking back along the valley to Half Dome. Just before Crane Flat, elevation 6,192 feet we turned onto Tioga Road driving through forest as we continued to climb. By the time we reached 7,000 feet we could see the granite hillside, and although there was still some forest, more and more rock was exposed. Lupines were blooming at 8,000 feet, but the flowers were very small. Also we were starting to see some junipers. We spent twenty minutes at Olmsted Point, named for Frederick Law Olmsted (1822-1903), the landscape architect who designed New York City’s Central Park and was first Chairman (1864-1866) of the Yosemite Park Commission. Passing Tenaya Lake we went on to Tuolumne Meadows, and in the 20.9 (13) from the Visitor Center there at 8,000 feet we climbed to 9,945 feet at the Tioga Pass Entrance to Yosemite National Park. Once over the pass we descended the eastern slopes of the Sierra Nevada and sagebrush now covered the hillsides as we entered Mono Basin National Scenic Area. We turned south on US-395 with the intention of visiting Devils Postpile National Monument, but reading information about it as we were driving along it became obvious that we would not be able to see this geological formation both because of the time and because you can only visit this location by shuttle bus! Also along US-395 we saw some snow fences, the first we had seen on this trip! From near Mammoth Lakes we struck out on a county road, Benton Crossing Road, unmarked except for a sign To CA-120, the road we would have taken had we not gone south the see the Devils Postpile. It was a great drive with no traffic! There were a few sparse junipers as we went up into sagebrush covered hills, almost reaching the tree line again. Rain clouds loomed ahead. After Wild Rose Summit, 7,650 feet, the road had a 12% downgrade. We came to the junction with CA-120 a short distance before arriving in Benton, where we joined US-6 and soon after that we drove across the State Line into Nevada, The Silver State. The clouds still looked as if we could run into some bad weather ahead. Typical for Nevada we would go over summits or mountain passes, descend into and cross wide valleys, then be back in more mountains. One valley was pretty barren and appeared to be a massive volcanic area, evidenced by the black rock lying everywhere. We witnessed some wonderful cloud effects in the sky and the sunset colors were rather spectacular. It was nearly 8 o’clock in Coaldale Junction when we joined US-95, the road from Reno. We thought about ending the day here but found Coaldale to be a ghost town, so no accommodation was available! Thus far there had been no rain, but lightning started to brighten the now darkened sky. The lights of Tonopah were visible for miles ahead. When we arrived in Tonopah, elevation 6,030 feet, the temperature was 74° and a gentle rain had started to fall. We drove along the main street a couple of times trying to decide on which motel to go to and settled on Golden Hills Motel away from the bright lights of the busy casinos. After unloading the car Stu drove to McDonalds to get our supper. Talk about “Going to the dogs!” Not only did we get our supper from McDonald’s last night, we were there again this morning! We filled the gas tank and were on our way shortly after 8 o’clock. Compared with the previous night Tonopah was a very quiet sleepy town. We stayed on US-6 when it and US-95 parted ways, the latter to go south to Las Vegas. Then crossing a wide flat valley, we started to see some Joshua trees to the south of the road, and a little later passed the road into the Tonopah Test Range. Once again we ran into construction after which the road rose into the next range, maybe the Monitor Range. After winding through hills we had a long straight stretch ahead, maybe Railroad Valley! It is difficult deciding on the right name because the Nevada map has numerous named ranges and valleys, but these do not match up always with signs along the road! A house! One house, just before the turn of off for Little Fish Lake, is located at the point where the road begins to cross the flat valley floor - still the same stretch of straight road. Later I could see a ranch to the south with green grass around it! Otherwise the land was covered with sparse, very low plants! After 32.2 (20) without a bend the road curved slightly and started to rise ever so gradually and we saw a few junipers scattered on the hillsides. Warm Springs is but a dot on the map! The only point of interest is that NV-375, named Extraterrestrial Highway, starts here, and this was the highway we wanted to take. It was the start of another long straight stretch flanking the eastern side of the Reveille Range. This valley looked a little greener than the previous one and the sagebrush bigger. There was also a ranch with trees around it indicating a source of some irrigation. As we drove south on a long straight stretch of road 64.4 (40), the hills to our right were all black as if consisting of volcanic rock. We were traversing a rocky plain, which gave way to green grass, cut hay and irrigation sprinklers. Ahead, to the left, was a dry lake bed. It was shallow but quite large, and miles down the road there appeared to be some water in it. Turning into the next range, we went over Queen City Summit, elevation 5,960 feet and, of course, descending from the summit, we faced ...you guessed it ... another straight road! This valley had a number of green patches, and to the north, another lake bed. One corner of the Air Force Range and Nevada Test Site was very close to the road at the point where we entered Lincoln County. There was a sign for Penoya Farms in the vicinity of Rachel, elevation 4,970 feet, and large haystacks could be seen to the south, as well as trees around ranch settlements. A coyote ran across the road in front of us, just as the road turned, ending a 43.5 (27) straight stretch, and went over Coyote Summit, elevation 5,591 feet. On the next straight stretch I noticed some small cholla cacti and yucca in the low scrub. It was all open range country and I could not help wondering what the cattle eat. There was certainly no shade for them on a hot day! More Joshua trees, a veritable forest of them, popped up and continued for some distance, even along the 9.7 (6) of winding road leading up to Hancock Summit, elevation 5,592 feet, but here they mixed with junipers. As the road wound down through rocky cuttings, the Joshua trees disappeared, but, looking out over the valley floor, there were lakes, ranches, and trees. NV-375 ended at the junction with US-93, which at this point, is a dotted highway on the map to indicate a scenic route. It was just after 10:30 and the day was becoming quite hot. Winding through the mountains, I was surprised at seeing more Joshua trees, some of them quite large this time, then junipers covering the hills. We ascended to Oak Springs Summit, elevation 6,237 feet, and from here we could see the stark beauty of four layers of mountains ahead. We drove through a series of rocky cuttings as the road descended and we decided that, even though there were no signs along the roadway, there must be deer in the area since there was a dead one at the side of the road. Crossing a river bed, the Meadow Valley Wash, we entered Caliente, elevation 4,398 feet, population 1,100, an interesting little town with private mineral baths, a Latter Day Saints church and a 1923 railroad depot built in Spanish style architecture. The hills were heavily wooded with juniper near Panaca Summit, elevation 6,719 feet. We hadn’t seen any of the wild horses! But there was a deer sign! Another lot of road work made progress slow, but I enjoyed seeing sunflowers, thistles and poppies all blooming. At 11:43 we crossed the Utah State Line, which also meant that we had left the Pacific Time Zone and were now on Mountain Time. Now at 12:43 the day seemed much shorter and we still had to cross Utah and hoped it would not be too late when we arriving in Grand Junction! From the border we took UT-56 east to Cedar City, located on I-15. After Modena we were crossing a sagebrush covered plain as we looked ahead to layers of mountains. On both sides of the road there were irrigated areas with large circular fields, green fields, sprinklers working, cut hay and quite a settlement with trees for wind breaks around the homes. From Beryl Junction, where UT-18 goes south to St. George, we still had 59.5 (37) to go to Cedar City. There were orchards and alfalfa being irrigated around Newcastle. From there the road started to wind into hills and, looking ahead, we could see a big mining operation. It was an extensive mine area, but there was no sign of a name for it nor a road into it, though we did pass a road to Old Irontown Ruins (not on map either). With a Utah red embankment at the side of the road we looked ahead to a big valley with Cedar City on the opposite side and in the distance the cliffs of Cedar Breaks National Monument. Driving into Cedar City, elevation 5,800 feet, we stopped to buy groceries, then took UT-14 into the mountains to look for a spot to have our rather late lunch. Heavy black clouds hung over the mountains and the weather did not look promising so I was having second thoughts about coming this way! We drove in through a narrow canyon with high rock walls and we knew it had been raining because the road was wet. We passed Zion Overlook and turned onto UT-148 to Cedar Breaks National Monument. It was raining by the time we reached the Visitor Center, elevation 10,350 feet, and due to the thunder storm, the outdoor overlooks were closed. Fortunately, the worst of the rain held off sufficiently for us to avoid being drenched whilst viewing the Cedar Breaks formation. We made two further stops, one at the highest point, Chessman Ridge, elevation 10,460 feet, overlooking Cedar City, and Northview, elevation 10,435 feet. After this we continued towards Brian Head, but turned off for Brian Head Peak and as we took the gravel road a flock of sheep were grazing in the meadow of the high country. There was snow, or maybe hail, on the road as well as in the grass and certainly a lot of the white stuff on the slopes further over the hills. Two hawks were swooping overhead. A 4.8 (3) climb on this rugged trail brought us to Brian Head Peak, elevation 11,307 feet, where Indian paintbrush, mountain phlox, cinquefoil, and fleabane were blooming by the path to the shelter at the top. Overlooking the surrounding countryside, we had our lunch standing in this shelter, built by the CCC in 1935. It was bitterly cold! Back on the highway it was a 13% downgrade to the Brian Head ski area with its many lodges and chair lifts. Unfortunately it was raining again, making it a rather dreary drive! However, our sightseeing for the day was over if we were to make it to Grand Junction at a reasonable hour! Or it would be limited to what flashed by as we sped over the miles! We had another pilot-escorted section of road work before reaching I-15 in a wide farming valley between sagebrush covered hills with multi-colored cliffs as a backdrop to the east . Entering the highway and vying with traffic which included rigs with three trailers, was a bit of a shock! We had to stop for gas in Beaver and twenty minutes later we reached the junction with I-70, Grand Junction now 418.4 (260)! The scenery was flashing past - Summit, elevation 7,076 feet, and deer running through the sagebrush. It was 5:56 when we passed the exit for Richfield and Maurice had told us that it was a four-hour drive from here to Grand Junction. With no children in the car and no plans to linger anywhere we wondered how long it would take for us to get there. There continued to be lots of color along the route especially in areas where the road passed through canyons. At one point there was a tunnel to the right of the road, an old railroad line which has been converted to a recreational trail. Out of the canyon the road was still winding until it reached the Summit, elevation 7,923 feet. The descent into the valley was quite sudden through high dark grey cliffs. We made a brief stop at a Rest Area, then sped on again, crossing the Green River as the light was fading. Grand Junction was now 156.1 (97). Passing the junction with US-191 to Moab, the sun was catching a couple of the cliffs and a rainbow appeared in the sky. Twenty minutes after crossing the Colorado State Line we entered Grand Junction and arrived at Maurice’s at 9:08, three hours and twelve minutes from Richfield! Today Stu’s car stayed in the driveway! After a relaxed breakfast Maurice took us for a drive to the Colorado National Monument. Meg had already started school, but Sandra and Coco were able to come also as they were not returning to school until the following Wednesday. Sandra and Coco were all over Stu! We went to the Visitor Center then took a hike along a nearby trail, the Alcove Nature Trail on the Kayenta bench. Maurice picked up a trail guide and Sandra read out the information about each numbered spot along the one-mile trail which came to an end in an alcove of the cliffs. Back in town we went to a wonderful local candy store, Enstrom’s, world famous for their almond toffee. There were free samples, and having tried it you could not resist buying! The store even has a web page. Besides their almond toffee they had small boxes of chocolate cups, each decorated with small royal icing flowers - very attractive. From Enstrom’s we went to the Water Park where everyone enjoyed the water slide (I enjoyed watching) and where Meg joined us after she had finished at school. We had a pleasant evening back at their place with much talking and looking at their pictures of their summer trip north to Vancouver and back to Grand Junction. Having talked to Richard on the telephone, however, it was decided that we had to leave next morning to return to Lincoln, and unfortunately, could not spend the next day at the Peach Festival. We had breakfast, then set off in two cars, Sandra and Coco with Stu and me with Meg and Maurice, for Palisade, where Maurice had arranged with friends for us to pick up a box of peaches. The friends had already left for the Peach Festival but our box of peaches, which Maurice gave us as a present, were ready for us at the back door. We stood around talking for some time and Stu and the girls played along the canal, throwing a stick into the water for a dog to retrieve. The friends’ dog was loose and very friendly. Just after 10 o’clock we left Maurice, Meg and girls for the last leg of our journey from Vancouver! In so doing we would make another assault on a mountain range, The Rockies, before descending eastward onto the Central Plains. At first the road follows the course of the Colorado River through canyons and valleys to Glenwood Springs, where the red rock in the area contrasted with the brilliant greens of shrubs and tree foliage. A renowned resort area, lots of people were in the pool at the Glenwood Hot Springs. From here through Glenwood Canyon, I-70 becomes what must be the most spectacular section of road in the interstate system. Through the narrow canyon pass the Colorado River, a railroad, a bicycle trail and the highway, the latter with the lanes in one direction being elevated above those going the opposite way. After crossing the Colorado River for the last time, the road, gaining elevation all the way, follows the coarse of the Eagle River. We drove through Avon, elevation 7,430 feet, Vail City Limit, elevation 8,150 feet and over Vail Pass Summit, elevation 10,603 feet. At Exit 203 for Frisco, we left the highway to take the scenic drive across the north end of the Dillon Reservoir and stopped at Starbucks in Dillon for coffee. From here we set out on US-6 to go over Loveland Pass, but there was so much construction, Stu felt that we could not afford the time such a delay would cost us, so he did an about turn. Disappointed as I was, I had to agree with him because we were still a long from home. We rejoined I-70 in Silverthorne, elevation 8,790 feet, and in the next nine minutes climbed to an elevation of 11,158 feet where we entered the Eisenhower Tunnel. From here into Denver, the Mile High City, we would drop 1 mile 598 feet. Dropping from the mountains into Denver, the odometer reading showed that we had traveled 5,000 (3,106.9) since leaving Vancouver ten days ago! 30.6 (19) later we left I-70 for I-76 which parallels the South Platte River into Nebraska. For the most part the river is not visible, just the fields of crops to the west irrigated with its waters, whilst the rolling country on the other side of the road is sagebrush-covered sandhills. Leaving the highway at a rest area for a quick bite of lunch, the heat was quite overbearing. It was 5 o’clock when we crossed the Nebraska State Line and 5:47 when leaving Mountain Time and entering Central Time Zone. So now it was 6:47 PM! With dusk descending over the landscape wildlife, turkey and deer, could be seen among the trees and wild sunflowers. We had hoped to reach the Archway just east of Kearney before the sun set, but did not make it, so no pictures! Actually there was a lot of something in the air which blanketed the sun and it just became a vanishing red ball, its rays not penetrating the air! By the time we reached Grand Island it was too dark to see deer! We arrived home at 10:11 PM after a long day!